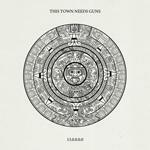 The world continued after December 21st, 2012 and the non-event that inspired 13.0.0.0.0, the new album from mathematic pop band, This Town Needs Guns, reads like a visual configuration of the band’s off-kilter melodies. In the vein of Minus The Bear or Pinback, This Town Needs Guns (who recently decided to shorten their name to TTNG in response to America’s current issues with gun violence), crafts a very delicate and circularly rhythmic distinctiveness, which is also infused with pop-influenced complexity. As with any airy or overtly accessible indie rock band, it would be understandable to approach an album like 13.0.0.0.0 with the perception that it will be easy to swallow. Initially, the album’s first track, Cat Fantastic, more or less confirms this until the song’s lines of melody reach a fork or two, divergence in sound adding complications, which become more apparent with Havoc in the Forum, whose shower of string play and rampant drum sections create this very intense musical arrhythmia that is eventually given some structure. Tim and Chris Collis, the band’s guitarist and drummer respectively, know when to color outside the lines and when to be more meticulous in their attack, a song like Left Aligned a veritable seesaw of melodic activity and harmonic softness. Vocalist/bassist Henry Tramain is a new edition to the band having replaced former TTNG singer, Stuart Smith. He’s a good fit, a falsetto that can navigate the syncopated rhythms and heavy melodies employed by his band mates. Though the band’s approach is fairly consistent throughout the album, there are instrumental ideas explored with tracks like In The Branches of Yggdrasil and Nice Riff, Clichard, the latter of which takes a shot at some melancholic Richard D. James beat invention. Between are the heavily percussive I’ll Take the Minute Snake and the acoustic 2 Birds, 1 Stone and an Empty Stomach, both of which sort of ride themselves to a close cyclically. Otherwise, Triptych and A Different Kind of Tall (Small) are expectedly off register with Pygmy Polygamy offering a small folk instrumental to break up the math. +3 Awesomeness Repels Water is the album’s final instance of aggression and signature before 13.0.0.0.1 ends the album with a dreamy array of guitar strings and piano keys. Possibly meant to quiet the uncertainty of the predicted apocalypse the band’s cover basically illustrates, 13.0.0.0.1 fades, its final act somewhat simple next to the rest of the album, whose contents could possibly convince listeners that pop melodies can be inventive when the promise of impending doom may forever halt the consequences of another day. How dramatic.